No contract. Cancel any time to get pro-rated refund at $5.95 per month, 365 days a year! Price does not increase on renewals. No contract. Cancel any time, 365 days a year! Learn. Grow. Create. Influence. Inspire. "I have been wanting to tell this to you for quite a while. Besides being an amazing, inspirational tool, and having the BEST customer support out there, I am also amazed by how you take the time to remind me each month that my subscription will renew in two days. I love that. Not a lot of companies do that, they just take the money and run :) Love you guys, keep up the wonderful work, you are making the world a better place by providing us yoga teachers and practitioners with this superb help. Thank you, Namaste". "I’m finding Tummee.com website & sequence builder extremely useful. It’s a great website & it’s got me out of my sequencing “rut”. What I really like is the whole library of variations on asanas that I currently teach & learning new poses. I’m really enjoying “doing” my class myself & I feel that my ability to plan a creative flowing class has improved 100%. The flows are what I’ve been trying to master myself. The drop down boxes to target specific muscles, abilities & yoga types is amazing. The website is so detailed but so simple to navigate. You have created something quite amazing, I’m so glad I stumbled upon it. I will be continuing my membership. " "I am visually oriented and like to have a class plan to glance at when I teach. I used to painstakingly draw stick figures for every class plan and even enjoyed the process - BUT - it is very time consuming, and if you change your mind about a pose or the order you have to start from scratch. With the number of classes I teach growing considerably, I found I was not creating as many sequences as I wanted, as to get them on paper would just take too long. So I had something in my head and just hoped I won't forget anything. Tummee was a game changer for me. Now, once I have a rough plan in my head, it takes minutes to have a neat, beautiful printout. The features being added are making an already good product great. The price point makes it accessible and the responsiveness and customer care are unbeatable. I could not recommend enough." "Tummee is incredible! Their yoga sequence builder has helped me tremendously. I am grateful that I came across this because it has saved me lots of time and made yoga sequencing much easier. Also, the figures are very well done and the site is easy to navigate. It seems they have thought of everything (Sequence statistics, Sanskrit pronunciation, Pose categories, etc.) but they are always adding great new features. The customer service is phenomenal. Quick to respond and genuinely interested in your feedback. If you are thinking about signing up for a yoga sequence builder site, choose Tummee!" Thank you so much for the outstanding customer service and for creating such a wonderful sequence builder!!" 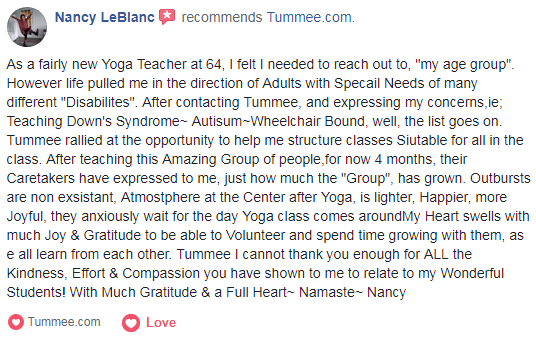 "I'm so grateful to have found Tummee. It's an incredible resource and tool for instructors or yogis who want to create their own personal home practice. The people behind Tummee are extremely knowledgeable, wonderfully supportive, helpful and quick to respond. Their service is exceptional. It really doesn't get better than this!" "I used Tummee.com sequence builder to make a session focussing on the lower 3 Chakras. It would have taken me a lot longer to do this had I not used your software. In fact I probably would have given up on the idea. I found the export function flawless, and, once I mailed it to myself, I was able to teach the class using my phone to display the sequence for me. The mobile format of a single column of images was excellent for this purpose. In fact, during teaching the class, I myself had a breakthrough in experiencing the connection between the asanas and their relevant chakras. So, thank you. Your work is outstanding in quality and usefulness." " I have been using Tummee to illustrate lesson plans for my students for several months. My students love the clear illustrations along with my own typed instructions, which reminds them what we have practised in class. The customer service has been excellent & I have requested many poses & a few sequences that were not already in the database. They are always happy to help provide an accurate illustration if one is not already available. Well worth the subscription, in my opinion! " " I just wanted you to know that your website has been a godsend. 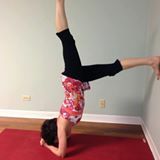 I am teaching a yoga elective at the high school I work at and meet with the class 3 to 4 times a week. Although I am pretty proficient at creating sequences, with my additional teaching responsibilities it would have been very difficult to keep the class fresh and innovative with having to come up with sequences on my own. Tummee provides a plethora of sequences that I can alter to fit my students' abilities. We've also been able to do sessions focusing on specific muscle groups or positions, largely because of the way you organize your sequence library. We even did an entire class devoted to partner sequences and they loved it! Truly, this was one of the best investments I've made and you have a loyal customer in me. " "Great tool for planning classes. Really helpful as I can build a catalogue of classes giving me variation and allowing me to get creative. As I have recently qualified its a great tool to help with my Sanskrit knowledge too!" 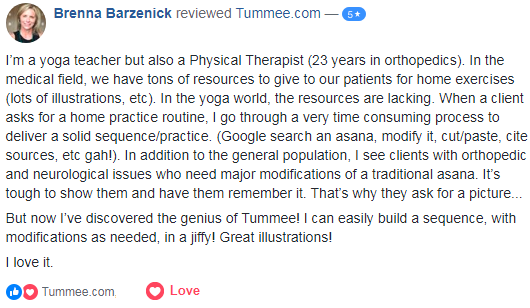 "I ultimately decided Tummee.com Yoga Sequence Builder is the platform for me because of two main things: I was able to save and share all my sequences in my own library and the great support and customer service for adding new poses and dealing with any questions. Thank you!" 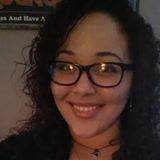 "I am quite excited with tummee.com site - I recently was certified and I find that it is much easier to sequence and teach using pictures than a script!" "I think your yoga sequence builder website is one of the best existing tools. I recommended it to my yoga teacher colleagues." "I have been telling everybody about your site. Two of my instructors seemed very impressed with it. I'm a student but will be graduating in two weeks and I only have four classmates but I will definitely spread the word! Thanks for your hard work!" "Thank you! Your yoga sequence builder has been a wonderful tool for me, as it has enabled me to provide additional assistance to private yoga clients with specialized sequences tailored to them and a place to save favorite sequences for my group classes." "I think your yoga sequence builder is a marvelous teaching resource for students and teachers alike. I think it really helps yoga training students see how a class needs to flow and how pacing works. I think that it's wonderful to cement the relationship between a teacher and a student by using the features of the builder to show a student how to do something. It is also a marvelous tool for establishing a home practice, especially for a newbie. There is nothing nicer than being able to look at poses and if any more information is needed to just click on it and get a YouTube video or explanation. I think that's a really nice feature." "10/10 for customer service. The team go above and beyond to answer queries and help with requests. The software has helped not only doing my sequencing but also in class with clear pictures. The software has been really user friendly and has so many great options and poses to make life that little bit easier. Thank you Tummee!!" "Of all the sequence builders Tummee is simply the best!!!" "A great site for teachers, there’s so much to add to the basics we have when we start teaching but even as experienced teacher I find the website so useful. And it’s so well presented". There is no contract. You can cancel any time, 365 days a year, to get pro-rated refund at the monthly price you signed-up for. Are my yoga sequences secure? Yes. All your yoga sequences are viewable only by you unless you chose to share them. Your yoga sequences are also backed up periodically. We accept all major credit cards: Visa, Mastercard, American Express, Discover. We use a third party payment service provider (stripe.com) for billing at no extra charge to you. You can call, chat or email us. Please see our contact page.